For the second consecutive year, the Spicy Peach is shipping in a truckload full of authentic sufganiyot from Israel. Options abound for trendy doughnuts in Atlanta this Chanukah season, but what if you want an authentic holiday feast? Where can you get your hands on Israeli-style sufganiyot, the fried doughnuts filled with jelly? 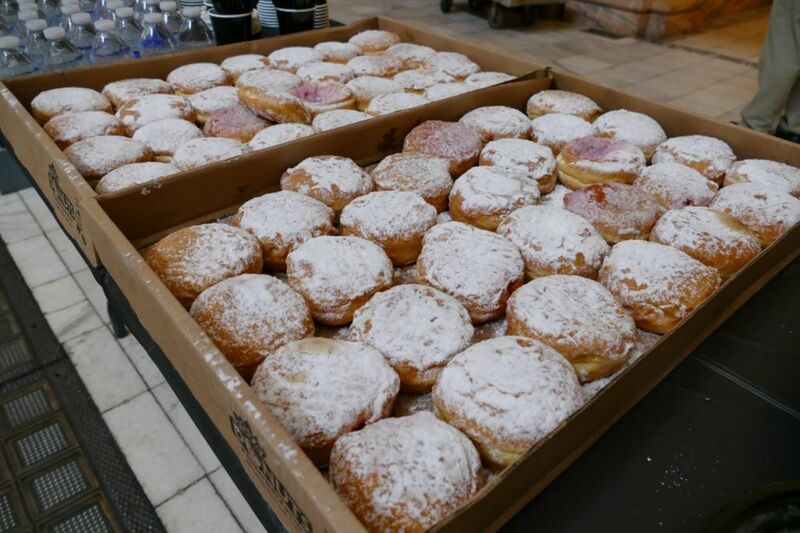 Plenty of shops in Atlanta are producing jelly-filled doughnuts (we have a full list of boutique donut shops here), some of which are kosher, but the AJT found only three sources for the Israeli variety known as a Chanukah treat. Israeli Alon Balshan, the executive chef and owner of Alon’s Bakery & Market, is baking authentic sufganiyot in a variety of flavors, including plain, custard, dulce de leche, Nutella and the traditional raspberry. Get them for $2 to $3 each at both Alon’s locations in Dunwoody (4505 Ashford-Dunwoody Road) and Morningside (1394 N. Highland Ave.). These sufganiyot are not certified as kosher but are available through the end of the year (remember, Chanukah doesn’t end until Jan. 1). Contact the Alon’s catering department at 678-397-1781 for large orders. Talk about straight from the source: The Spicy Peach in Toco Hills (2887 N. Druid Hills Road) is getting a truckload of frozen sufganiyot shipped directly from Israel. These decadent delicacies are kosher pareve and available now until the order sells out. The Spicy Peach is selling only around 300 to 350. A case of 35 sufganiyot is $44; singles are $1.49. Call 404-334-7200 for more information, or email info@thespicypeach.com. Jodie Sturgeon’s For All Occasions and More catering is baking kosher-certified, pareve, Israeli-influenced sufganiyot. Last year Sturgeon baked about 2,000 sufganiyot for Jewish Atlanta, but she expects to make fewer this year because the holiday is so late that many potential customers are traveling out of town. Sturgeon said one of her sufganiyot is about three times the size of a Krispy Kreme jelly doughnut and has twice the filling. Because her sufganiyot are so fresh, she gives customers powdered sugar to add on top when they’re ready to eat them so the sugar isn’t absorbed. The sufganiyot sell for $19 per dozen or$1.85 each. Call 404-953-8157 or email office@faocatering.com to order. The kosher Krispy Kreme location at 295 Ponce de Leon Ave. in Midtown doesn’t make sufganiyot but for special orders will make a raspberry jelly doughnut topped with powdered sugar instead of the usual glaze. The Publix in the Toco Hill Shopping Center (2969 N. Druid Hills Road) produces kosher dairy sufganiyah-style jelly doughnuts topped with powdered sugar in a variety of flavors. Both Bon Glaze locations in Buckhead (3794 Roswell Road) and Brookhaven (3575 Durden Drive) are producing round jelly doughnuts for Chanukah and Star of David doughnuts without filling. Call 678-691-4534 to order. The newly Atlanta Kosher Commission-certified doughnut shop in Toco Hills (2566 Briarcliff Road) is producing kosher dairy star-shaped jelly doughnuts for Chanukah.